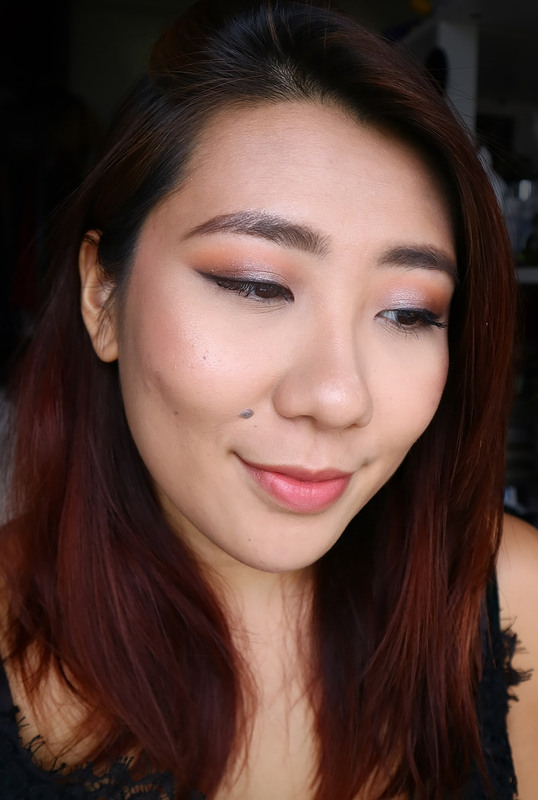 As mentioned in my previous posts here and there, I've recently been into more subtle and natural highlighters that give a lovely natural sheen to the skin without being over glittery. Basically, ones that make me glow instead of sparkle. 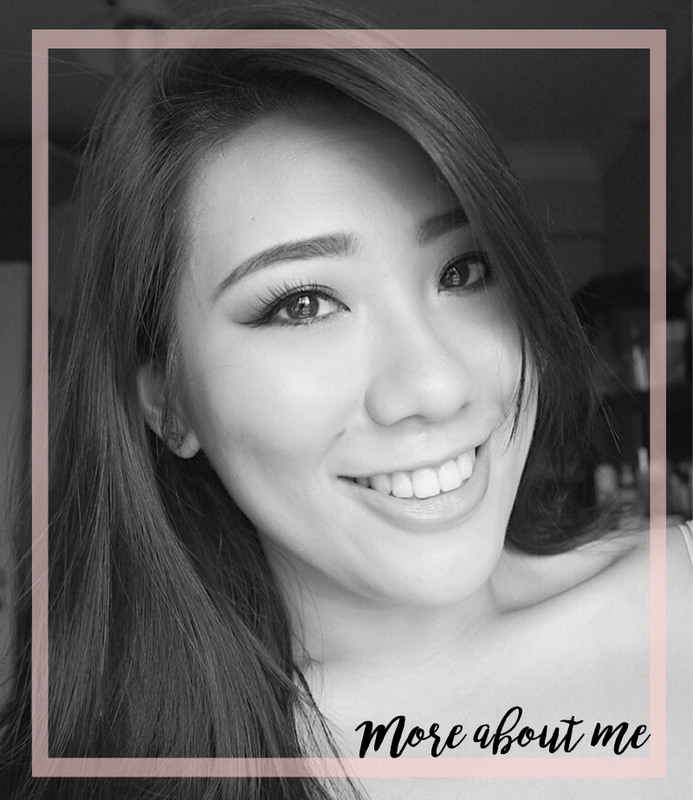 I still have my stash of sparkly and glowing to space highlighters, but currently, they are put aside as I am favouring the less-is-more makeup looks the past few weeks. I was browsing iHerb recently and noticed that they have added new ELF baked highlighters so I'd thought I would give one a shot. 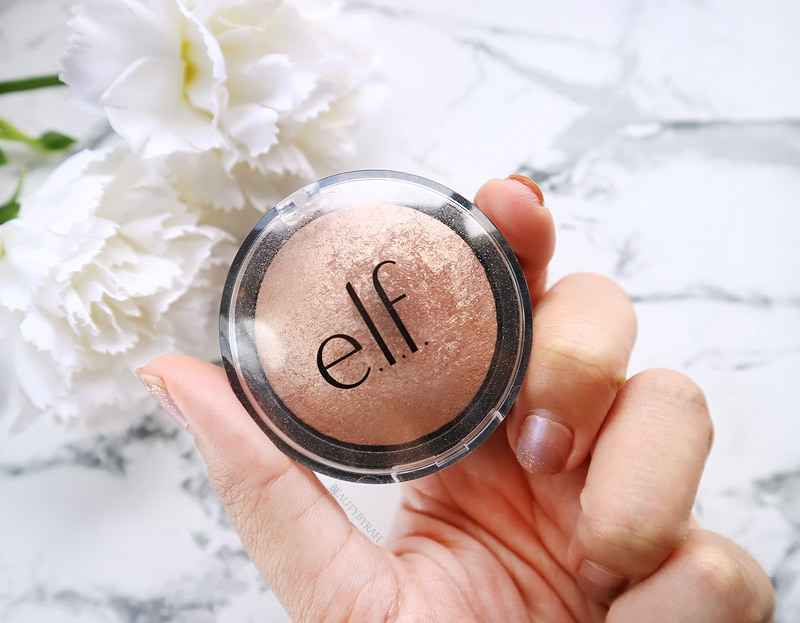 I got myself the ELF Baked Highlighter in Blush Gems and boy am I glad I added it to cart. This baked powder highlighter is packaged minimally, the same as the other baked products from their range. This is perfectly fine by me, as we get to save money that would have otherwise gone into fancier packaging. I do like the transparent cover, as it makes it extremely easy to tell the shade of the product and makes it easier to plan out my looks! When this product first arrived, I swatched it and barely any product came out. Barely. But I've read online that I have to pretty much remove the top layer or film of the product before it gets good, so that's what I did. After a good 1 minutes or so of vigorous swatching and rubbing off the top layer, I started to see more and more pigment being deposited onto my fingers. I tried it with a brush and the result was glorious. This highlighter is a warm bronzey champagne that imparts glow and radiance to the skin without any glitter. It reflects light beautifully without going over the top and in my opinion, it makes the skin look healthy and glowing. 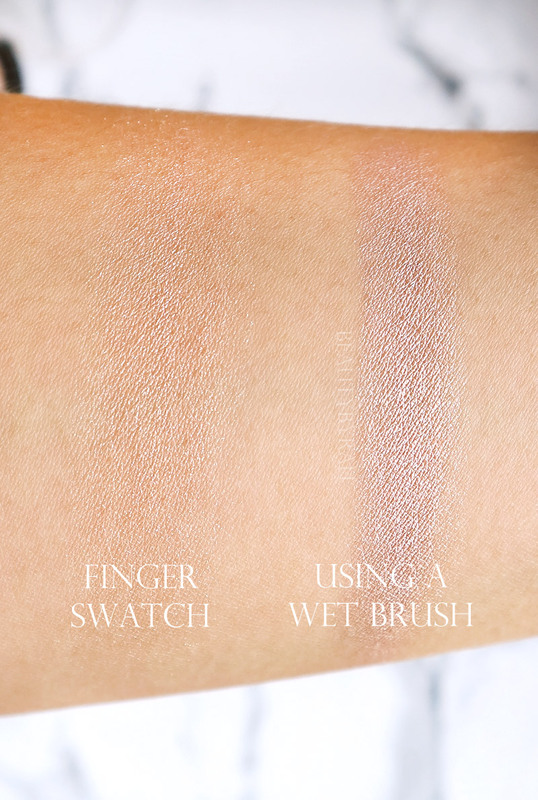 Also, from pictures I've seen online of swatches, this looks like a dupe for the notorious MAC soft and gentle! I am falling in love with the shade as it adds a hint of warmth to the skin without being overly bronze or orangey. As I am pretty tan, highlighters that contain white and silver reflects can look ashy on me and I am not exactly a fan. This shade complements my skin tone perfectly and I really do enjoy how it looks on the skin. 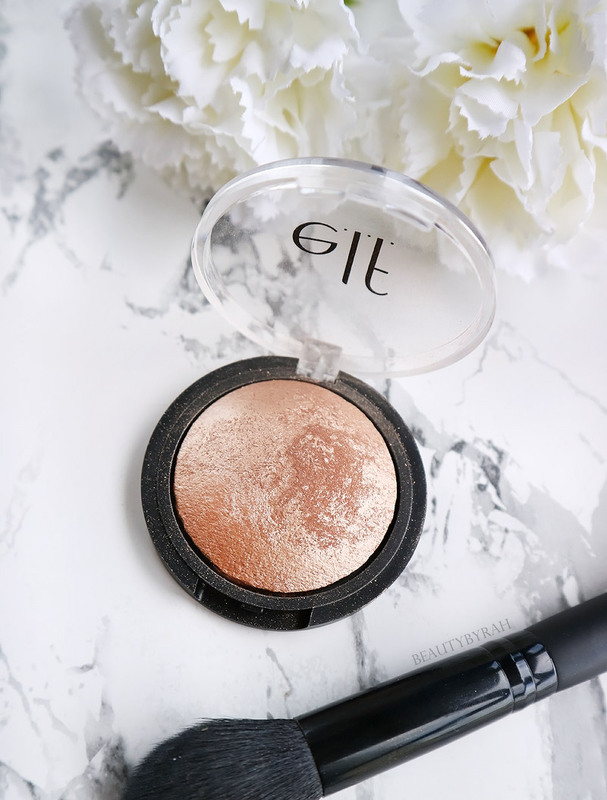 According to ELF, this highlighter is infused with vitamin E and hydrating jojoba, rose hip, sunflower, apricot, and grape oils to nourish the skin and it is meant to be long wearing. I do find that the glow does last nicely on the skin throughout the day and even at the end of the day, despite all the sweat and oil, it does not look like I smashed my face into a grease pan. 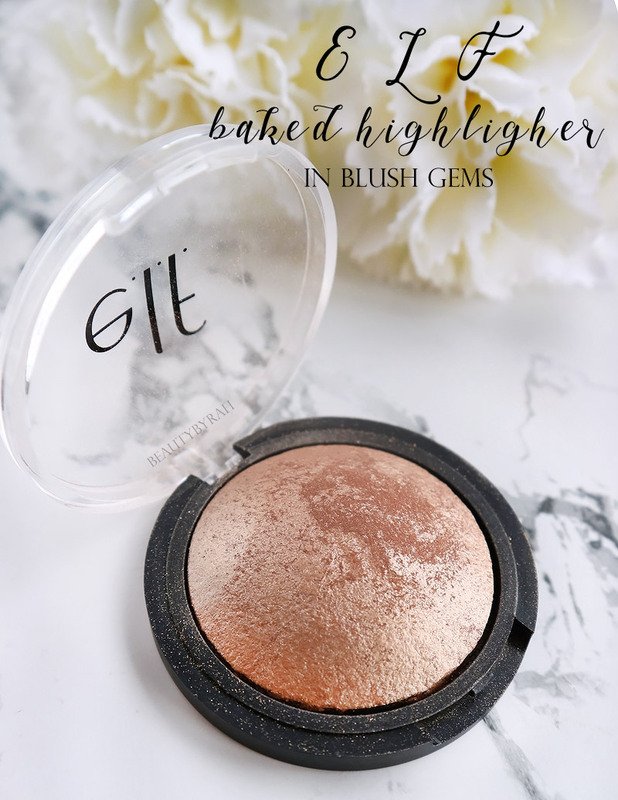 As it is baked, this highlighter can also be used wet, and it really does intensify the glow. I rarely do so, but if I plan to use this on the eyes (somedays I do my entire face using only highlighter, blush and bronzer), I do spray a little setting spray or water onto my brush before dipping it into the product and it works great. In the picture above, I used this highlighter for the top of the cheekbones and I sprayed my brush before applying it on the inner half of the mobile eyelids. Lips are the Labiotte Wine Lip Tint in CR02 Riesling Coral [review and swatches here] if you're interested. Overall, I do enjoy this highlighter and I do recommend it if you're on the hunt for an affordable / drugstore and natural highlighter without any glitter. This shade does work nicely with warmer and asian skin tones, in my opinion. I am definitely a fan and am interested in trying out more of their shades in the range, especially Moonlight Pearls! This also retails for USD 4 on ELF Main Website here. Do you have any other affordable highlighters to recommend?